Bangkok (Thailand) – September 28, 2018 (travelindex) – Best Western Hotels and Resorts today marked an industry first, introducing a pair of boutique brands – Sadie HotelSM and Aiden HotelSM. Sadie Hotel will compete in the upscale segments, and Aiden Hotel will compete in the upper midscale segment. These conversion brands offer developers an opportunity to reposition existing properties to improve their performance and enhance their asset value. These brands will offer hoteliers a design program with unprecedented flexibility. Sadie Hotel and Aiden Hotel’s edgy personalities will be reflected across each hotel, starting from the moment travelers enter the colorful, imaginative lobbies. The same charming style will be interwoven throughout other common areas and in unique guestrooms, services and amenities. The appealing brands will allow hoteliers to tap into the local flair of their market, broaden their customer base, and achieve higher RevPAR. Every hotel will be provided unparalleled systems and support, and will be on boarded in a rapid ramp-up with near immediate access to Best Western’s award-winning website, global partnerships and sales team, and state-of-the-art revenue management system. Hotels will also have access to a revenue manager to maximize revenue and reduce operating costs. 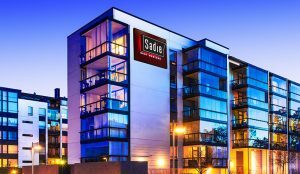 And similar to other Best Western branded hotels, Sadie Hotel and Aiden Hotel owners will experience the strongest brand support in the industry with attractive fees.